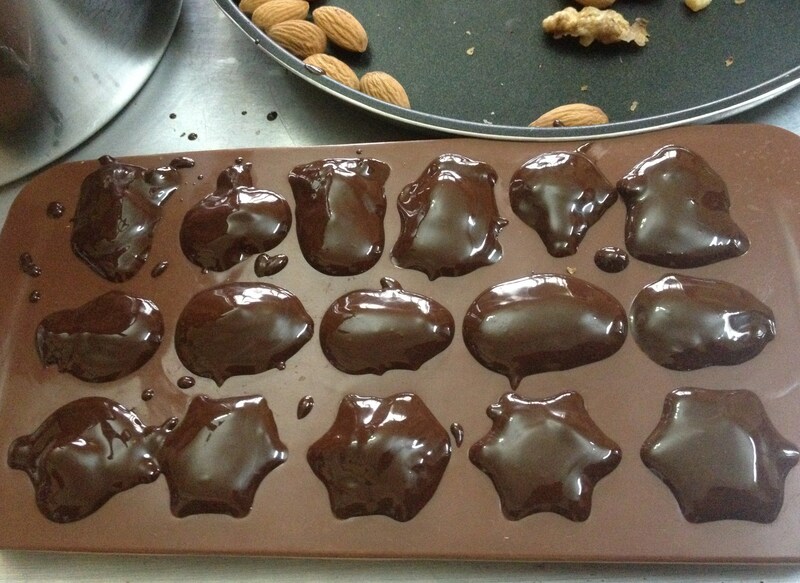 When I bought this beautiful silicon chocolate mould, my urge to make chocolates soared up..justified isn’t it? 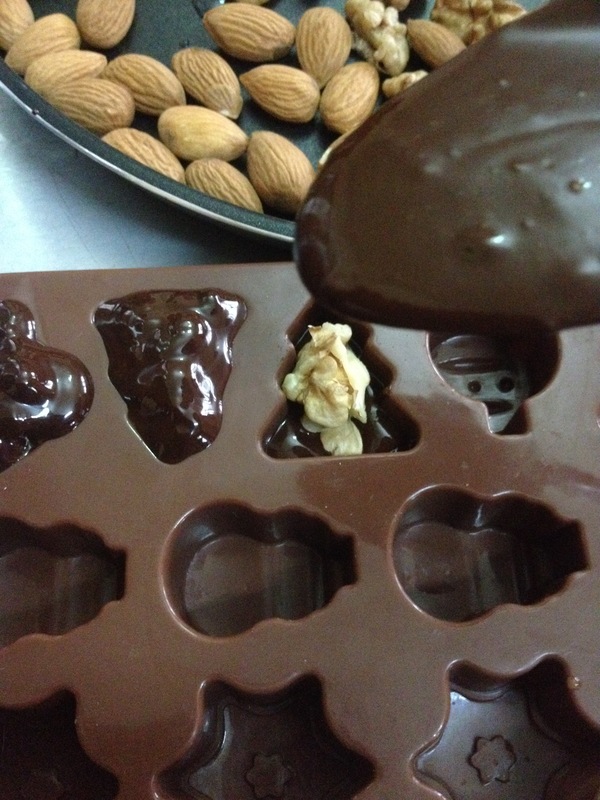 Though there is a plan to make chocolate from scratch at home, I chose to make the easier version – nut filled chocolates with available dark chocolate. If you are like me – who doesn’t want the chocolate manufacturers to decide the amount of sugar that you would like to have in your chocolate, then choose chocolates with 90% or 80% cocoa content and add your own bit of sugar to sweeten. Else, just choose your favourite chocolate bar. So,first step – feel free to choose your favorite – milk chocolate, white chocolate, dark chocolate with 50-70% cocoa or the bitter lot – 80%-90% cocoa. I chose to combine 80% and 90% cocoa bars, as my family loves bitter chocolate. 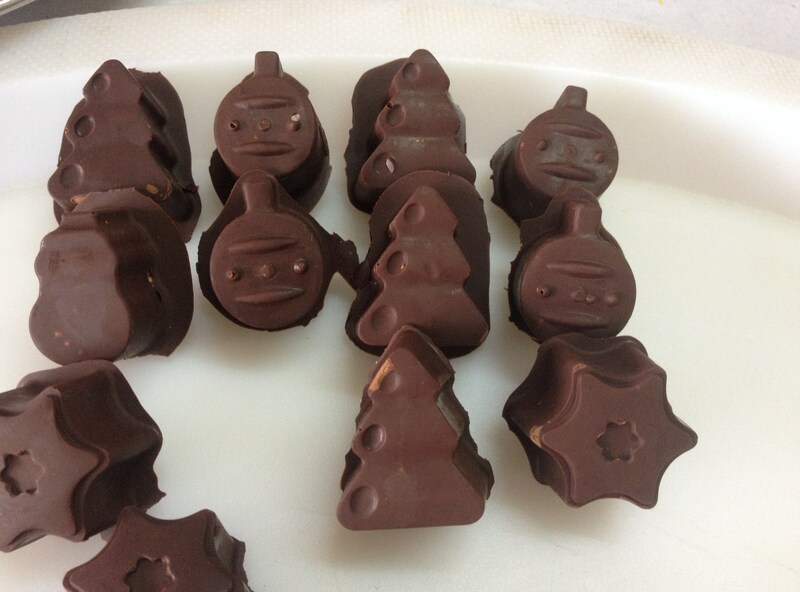 Any chocolate you use – follow these simple steps to get your own nutty chocolate. 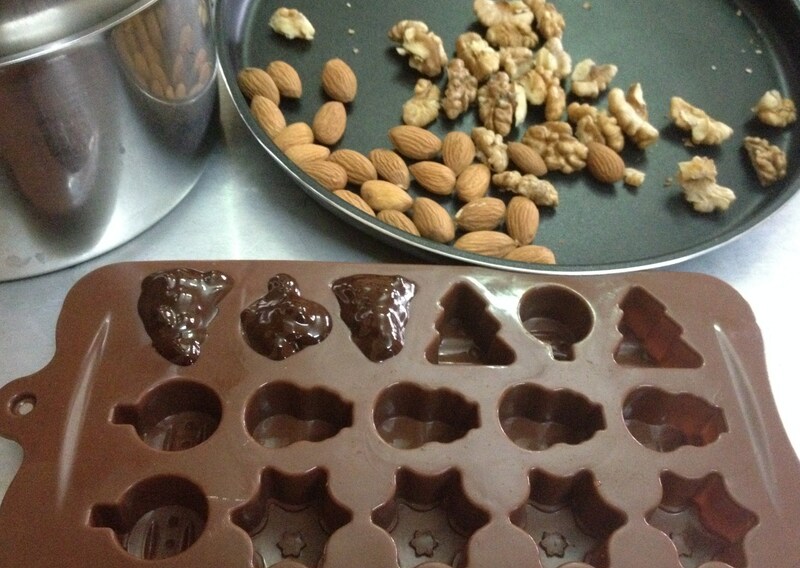 Also, choose your own filling – I filled them with almonds and walnuts. Raisins, dates, dried prunes, dried berries, hazelnuts, pecans, peanuts and many more can be suitable variants. For a beginner like me, I thought nuts or dried fruits might be the better fillings than making cream or caramel centres. Preheat oven at 175 degrees centigrade and place the tray with nuts and toast initially for 5 minutes. After 5 minutes, take out and give it a shuffle. This will enable even toasting of nuts on both sides. Toast again for another 5 minutes.. checking after every 2 minutes. If they are crisp enough before 5 minutes, remove them. If using stove, take a pan with half filled water and place another bowl over it. While boiling, water shouldn’t touch the upper bowl. 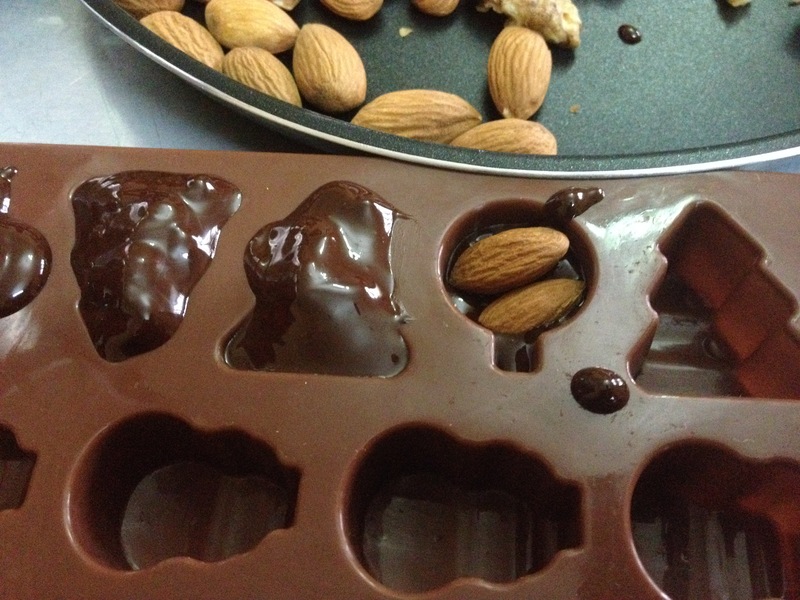 Place broken pieces of chocolate on the upper bowl and let it melt in the steam of the water in the lower bowl. 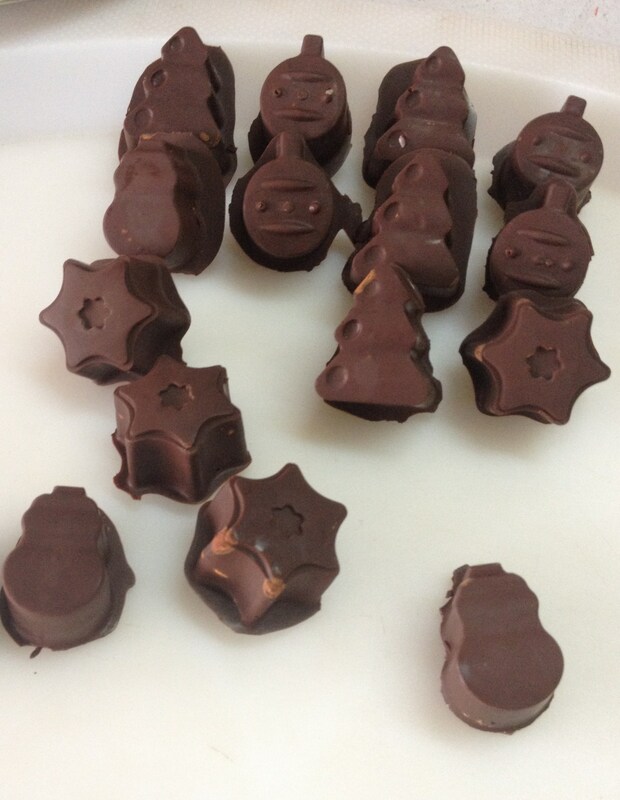 If using microwave, place chocolate pieces in a microwavable bowl, and microwave in medium high for 1 minute initially. 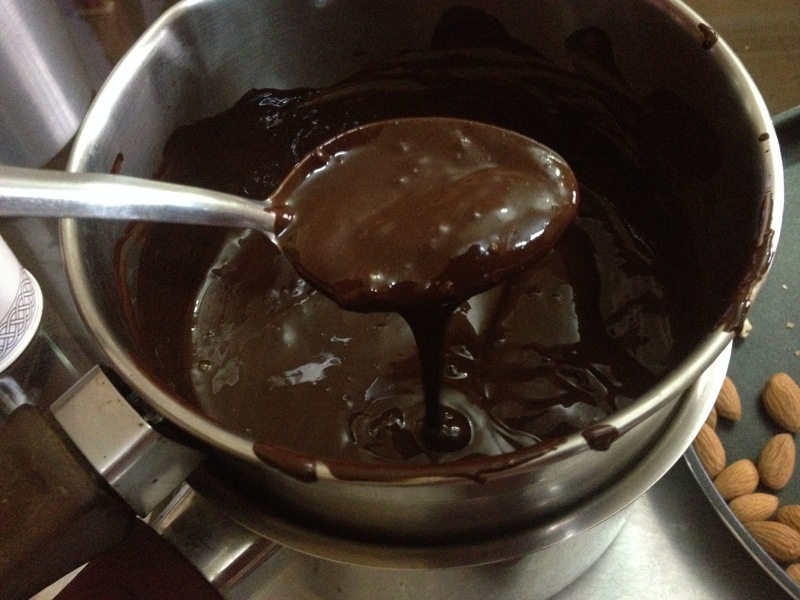 Take the bowl out, stir and microwave again for 20 seconds.. Repeat the process until chocolate is completely melted. Be cautious, overdoing might harden the chocolate. 1. 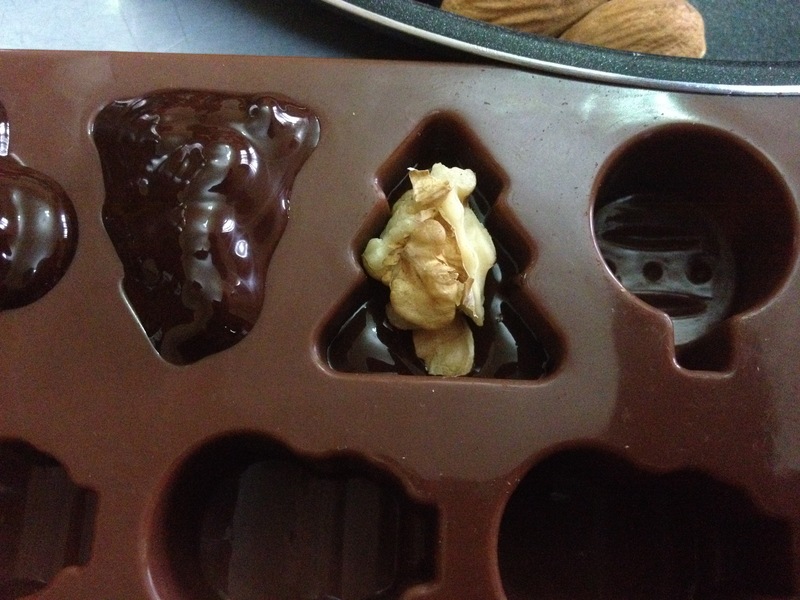 Pour melted chocolate until half of the silicon mould. 2. Place nuts inside. Either place almonds alone or combine both.. choice is yours. 3. Pour more chocolate to close the mould. 4. Place in refrigerator for 10 minutes or until firm. If you let to cool by itself, it might take at least half an hour to solidify completely, or even more. 5. Remove from moulds once cooled and store in air tight containers in normal temperature or in refrigerator.